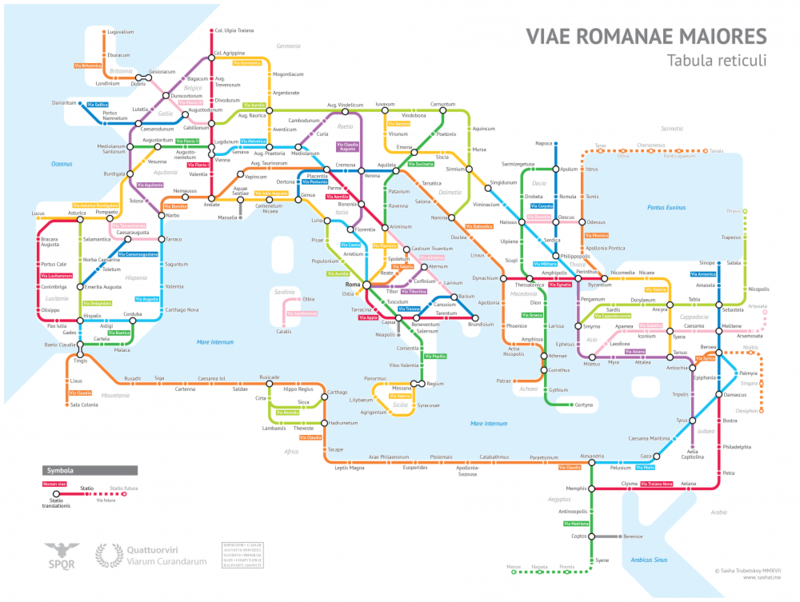 Sasha Trubetskoy, an undergrad at U. Chicago, has created a "subway-style diagram of the major Roman roads, based on the Empire of ca. 125 AD." Drawing on Stanford’s ORBIS model, The Pelagios Project, and the Antonine Itinerary, Trubetskoy's map combines well-known historic roads, like the Via Appia, with lesser-known ones (in somes cases given imagined names). If you want to get a sense of scale, it would take, Trubetskoy tells us, "two months to walk on foot from Rome to Byzantium. If you had a horse, it would only take you a month." Quick question, does anyone know who gave our post a mention on Facebook? I was led here from dangerous mind’s fb page. So it was probably them. I sent the cash to Sasha via PayPal, but I haven’t received any file yet. Thanks. So do we need to change horses if we change from one road color to another?